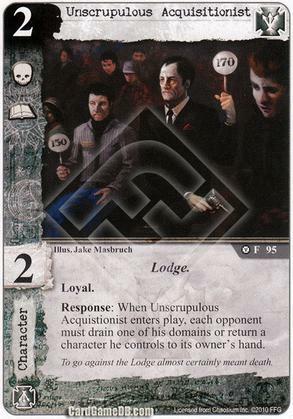 Flavor Text: To go against the Lodge almost certainly meant death. If the opponent already has all domains drained, can they still choose to drain a domain and therefore get out of having to return a character to hand? "each opponent must drain one domain or return a character he controls to its owners hand"
"If a player is given a choice of 2 effects from a card, can he choose an effect he cannot complete?" There are other LCGs where they can, and this guy wouldn't be very good as a result. Hence the question. "There are other LCGs where they can, and this guy wouldn't be very good as a result." ​Can you give an example? I suspect that the situations are not that similar but I cannot confirm this without seeing an actual card. type. If you cannot perform one of the options, then you must perform the other. Anyway, what VonWibble has in mind, is most likely Penny, who still allows choice of something that would not happen on that side (as far as I recall). There were also other cards, but most of those got changed via FAQ at one point. And yes, the fact that there is no 'choose' here, makes the whole thing quite obvious in the first place (even with AGoT rules), and even if it didn't, CoC behaves a lot more intuitively with regard to such a situation with the 'choose' word being thrown in the mix (here's an FFG forum thread discussing Apeirophobia, which is kinda related, end result being that FFG ruled you cannot go with the 'drive insane' option if it is not possible). So, I'm with dboeren, no AGoT-y squirming out of this one. Thanks for confirming. 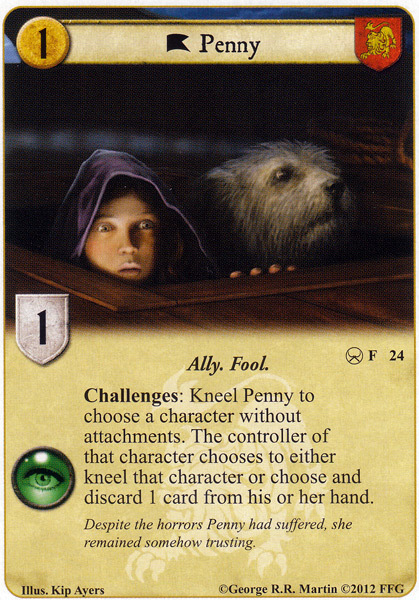 Yes, cards like Penny (and Sorrowful Man before changes to the FAQ) were what I had in mind. And I'm quite glad the intuitive ruling that you mention is perceived as the correct one.